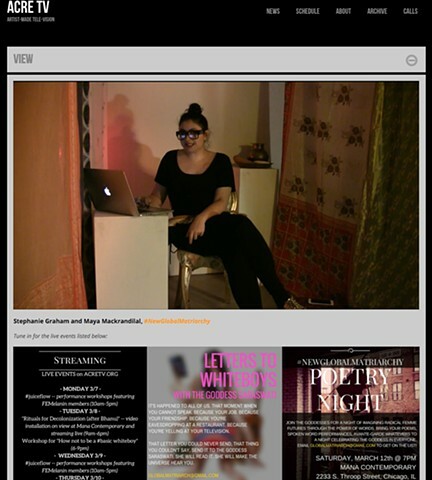 This screenshot documents a 24/7 livestream for the artist-run internet TV station ACRE TV created in collaboration with the artist Stephanie Graham. Together, we generated content for the livestream for one week which included livestreamed performances, public participatory events, and video. All content was either created by us or by other women-identified artists of color that we selected/invited to participate. This still depicts a livestreamed performance titled "Letters to Whiteboys" in which I performed as the goddess Saraswati and read letters written by women of color addressed to white men, saying the things they could not say to them in person, a way to release the negative energy associated with encountering micro- and macro-aggressions. This performance was later part of the Chicago Home Theatre Festival. Below the performance still are some images promoting some of our content on the livestream.